Are you looking for the ways to improve shopping experiences for your customers? The IWD Magento 2 dealer/store locator module will get you closer to the aim. It is designed to help your clients find the nearest store to their current location so that they can visit it and see your products personally. All they need to do is to indicate their country, city or zip code and the map will show all available stores within the specified radius. 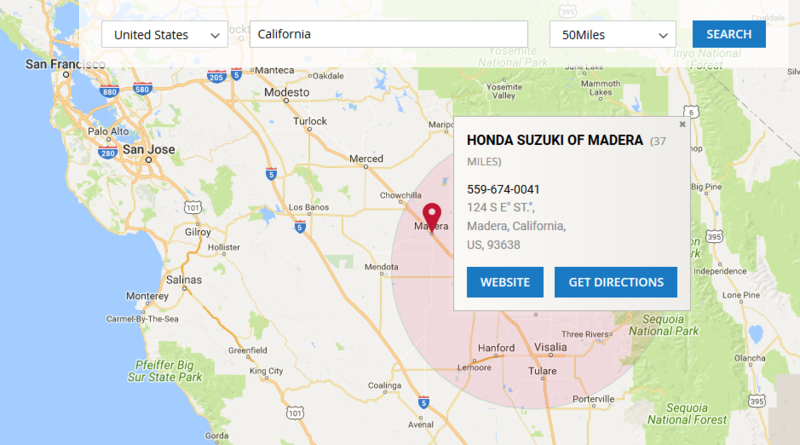 Moreover, with this Magento 2 dealer/store locator extension, your customers can easily obtain directions to the particular store through the Google Maps. 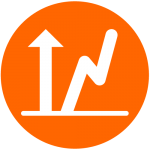 The IWD locator extension is a convenient tool that allows you to create as many locations as you need and provides you with a simple means to manage them on a single table. adding new locations whenever you want. The extension’s frontend is smooth and easy-to-use. The IWD Magento 2 dealer/store locator provides customers with a simple way to find your store located nearest them and seek directions to it through the Google Maps. The module allows users to search for the store’s locations by indicating their country, city and state, or zip code, and radius. 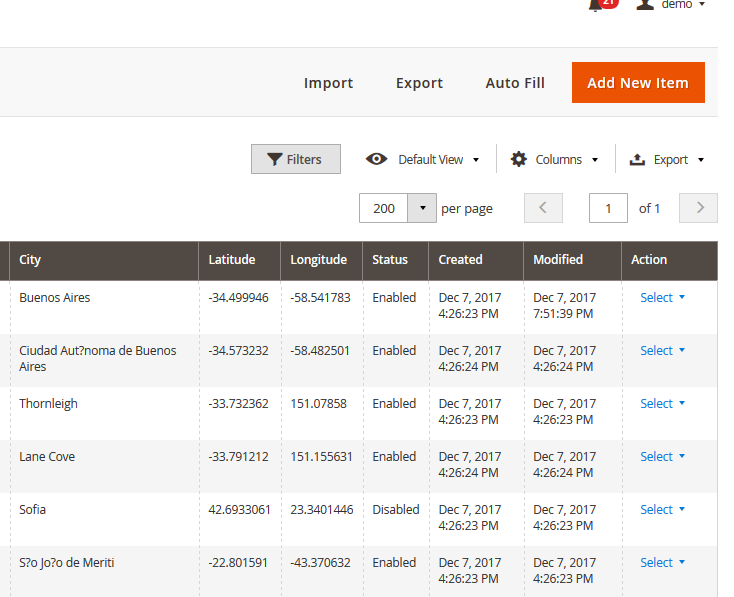 After setting all necessary parameters and initiating the search, the Magento 2 dealer locator extension automatically identifies your stores’ GPS coordinates and displays the position of those within the search radius. They will be marked with a special icon on the map. Upon clicking on the marker icon, a user can see the store’s name, contact number, address and link to its website. There is one more option called Get Directions that opens Google Maps in the new tab where the store’s address is already entered as the destination point. All the user needs to do is to indicate their current location, and the map will show the possible routes to the particular store. The backend configurations are also rather simple. In the backend, you can manage the extension’s functionality by configuring general settings, Google Maps, search settings, and adjusting the design. As usual, there is an option to enable or disable the IWD extension in General settings. Next, you can specify the title of the store locator page. Take into account that it also appears as the meta title. 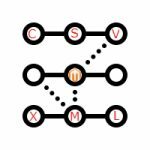 Apart from that, this Magento 2 extension allows you to specify the URL path to the locator and change the text link in your store’s header. If you wish, you can choose not to display the text link at all. 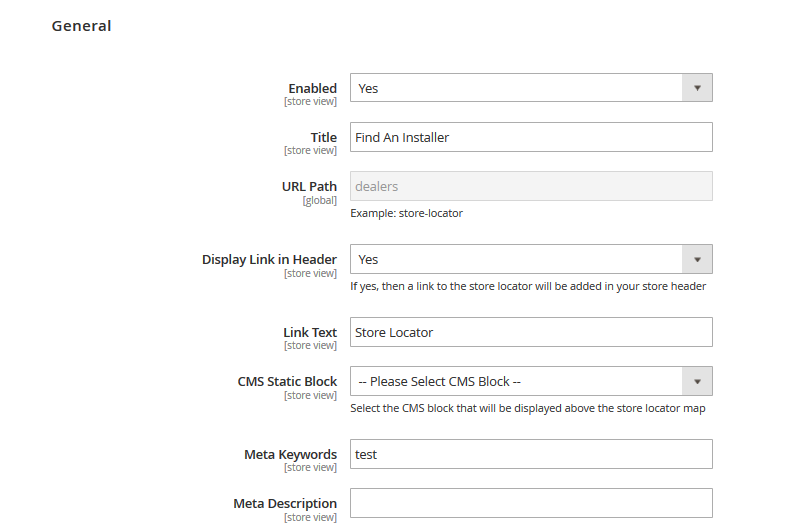 Optionally, you can select a CMS block for displaying banners or other content above the store locator and, what is important, add meta keywords and description. In Google Maps settings, at first, you need to enter your browser’s API key to activate the Google map on the store locator. Then, provide your server’s API key if you want to identify users’ current location and find stores that are nearest to them. So, basically, the store locator system will not function properly without browser and server API keys. Google Maps settings allow you to change the marker icon that displays store locations by browsing own image. Also, you can control if users can zoom in or out of the map and change its type: satellite or map view. And, lastly, you decide whether the scale is to be displayed on the Google map. The following set of settings allows you to manage the locator’s search functionality itself. 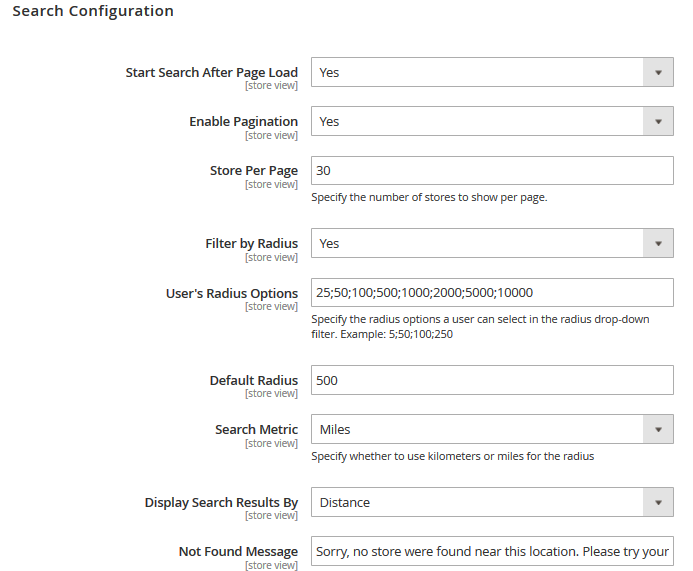 In Search Configuration, you define whether the store locator search starts right after the page finishes loading. Choose Yes in Start Search After Page Load field if you would like your customers to see locations closest to them automatically. Here you can also indicate how many locations are allowed to be shown per page and enable or disable pagination if more stores are found than the number permits. The Magento 2 store locator module allows your customers to narrow down the search results filtering them by radius. And it’s up to you to define the metric (kilometers or miles) and the radius options that the customers can select in the radius drop-down filter, like 25; 50; 100; and so on. 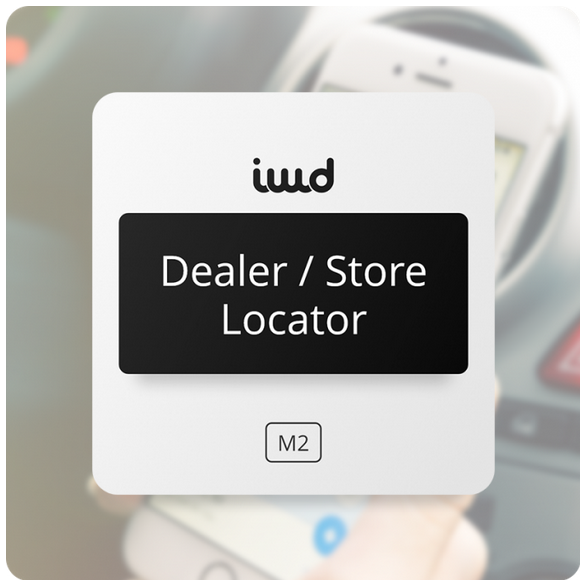 With IWD dealer/store locator you can determine whether to display search results by distance, position, or title. And lastly, in Not Found Message, you specify what message the customers will see if no stores are found in their search. The Magento 2 store locator module also has configurations for adjusting its design. In Design settings, you choose whether to display the Google map in full or fixed width. Then, you define what placeholder picture the customers will see for locations without images, or you can just hide them by selecting Yes in Hide All Placeholders. 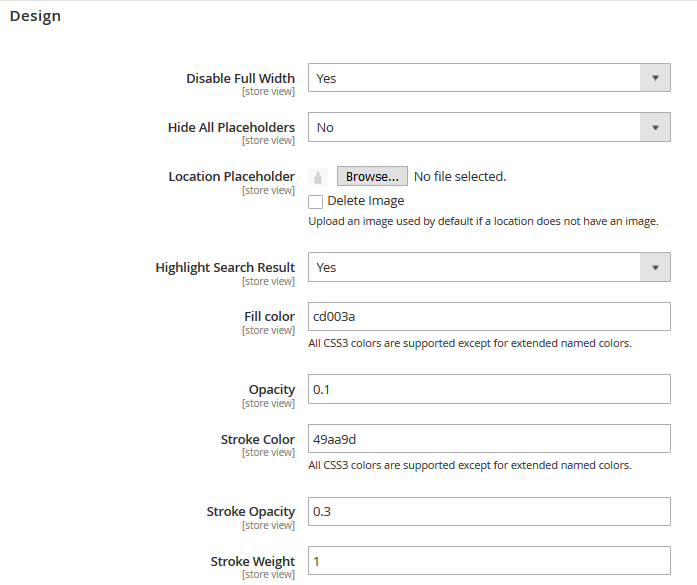 The IWD locator extension provides several options to configure the search radius. You can activate or deactivate it, specify its color and opacity. Also, you can define color, opacity, and weight of the search result stroke. In the end, there are two options left: to put a limitation on the count of stores for filling location during one running and to enable/disable scheduled auto-filling. 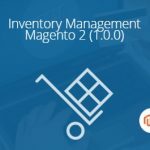 That is all about the backend configurations, but the Magento 2 dealer locator module does not stop there and provides you with a table where you can conveniently manage all your locations. To access it, go to CONTENT and then choose Store Locator where you will find a Store Locator Items table. The Store Locator Items table holds ID, Name, Country, State, City, Latitude, Longitude, Status, creation and modification date for every store. The last column Action allows you to edit a particular location or delete it from the table. 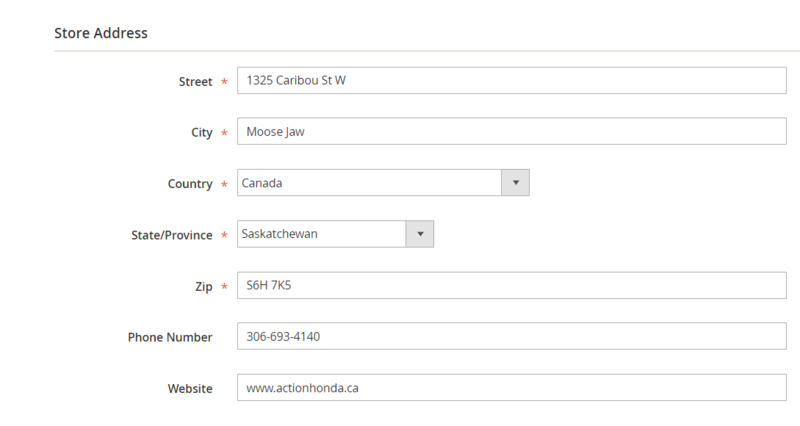 You can filter locations by such criteria as ID, creation date, modification date, store view or/and its status. Click Select -> Edit to open Store Information page, where you can modify store’s name, description, status (enabled/disabled), position in the search results, and store view. To specify the order in which the store is shown in the search results, you need to enter a value greater than 1 to signify its importance. On Store Information page, you can also edit address, phone number, and website of the location that will be displayed to customers on the map. 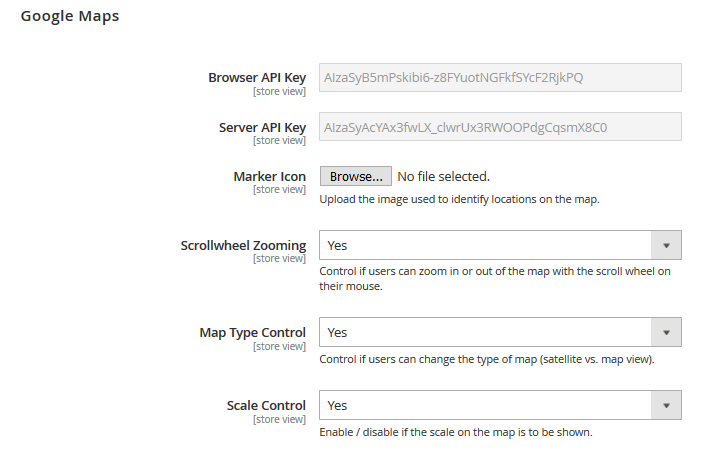 And last but not least, with this IWD extension, you can upload an icon for a location that will be shown in the pop-up on the map and add or change location image which users will see in the search results. If you want to create a new store, click Add New Item and you will be transferred to the page similar to the one where you edit store information, only here all fields are empty. Once you fill in all the necessary parameters, the new store location will automatically appear on the map. This Magento 2 module is a great tool to display your store locations on the map. Its user-friendly interface will help your customers quickly locate the nearest store with your products and get directions to it via Google Maps. It also enables you to add as many locations as you need and edit the existing ones in a few clicks. The price of the IWD Magento 2 Dealer / Store Locator Module starts at $199 for Community Edition including 90 days of the free upgrade. For additional $125 the Support team will assist you with its installation.